England forward Theo Walcott is set to return to action for Arsenal in October after 10 months out with a knee injury. He is likely to make his comeback after the international break, with England playing San Marino on 9 October and Estonia three days later. Walcott, 25, ruptured the anterior cruciate ligament in his left knee during an FA Cup third-round tie against Tottenham in January. As a consequence he missed a second successive World Cup. If the former Southampton player makes his return in October, that would make him available for England's Euro 2016 qualifier at home to Slovenia on 15 November, followed by the friendly away to Scotland on 18 November. 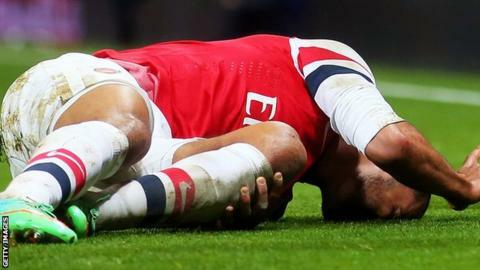 When Walcott suffered the injury it was initially suggested he would be out for six months, before the target was revised. Speaking to the Arsenal website earlier this month, Walcott said: "I knew how long the rehab would be, it was always going to be around nine months. "But I approached it that I had to enjoy it, and that's what I have done, it's given me the opportunity to work on my legs and build up the muscle strength. "If anything, I hope to come back stronger and quicker." He added: "There may be one or two under-21s matches I'll be involved in first. I'm just looking forward to getting out there and playing again."